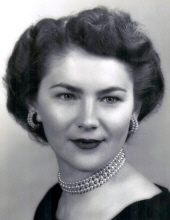 Josephine Johnson Willey, age 88 of Lenoir City, passed away peacefully on January 10, 2019. Jo was born in Dobson, NC, on March 3, 1930 to Dillard and Mallie Johnson, the fifth of nine children. After graduating from Dobson High School in 1948, she worked for Spainhour's Department Store as a buyer. In 1951 she married her husband of 59 years, Frank Willey. In 1958, they moved to Titusville, Florida, where they lived for 38 years and raised their family. After Jo retired from the Brevard County Court Clerk's office, she and Frank moved to Fletcher, NC, to be closer to family. As their health declined in later years, they moved to the Knoxville area to be closer to their only child, Cynthia. Jo was a wonderful mother, wife, sister, aunt and friend. She was beautiful, charming, intelligent and had a great wit. She loved to dance, bake and entertain. Her key lime pie was everyone's favorite. She was happiest in the company of her family and friends. She is preceded in death by her husband; parents; sisters, Kathleen Wolfe and Gladys Woodring; and brother, Clarence Johnson. She is survived by her daughter and son-in-law, Cynthia and Craig Smith of Farragut and grandson Evan Smith of Knoxville. She is further survived by 3 sisters, 2 brothers and a large and loving extended family. The family will receive friends from 2 to 3:45 p.m. on Friday, January 18th at Moody-Davis Funeral Home in Dobson, NC, followed by a funeral service at 4 p.m.
She will be interred on Saturday at Mt. Pleasant Baptist Church Cemetery, State Road, NC. To send flowers or a remembrance gift to the family of Josephine Johnson Willey, please visit our Tribute Store. "Email Address" would like to share the life celebration of Josephine Johnson Willey. Click on the "link" to go to share a favorite memory or leave a condolence message for the family.